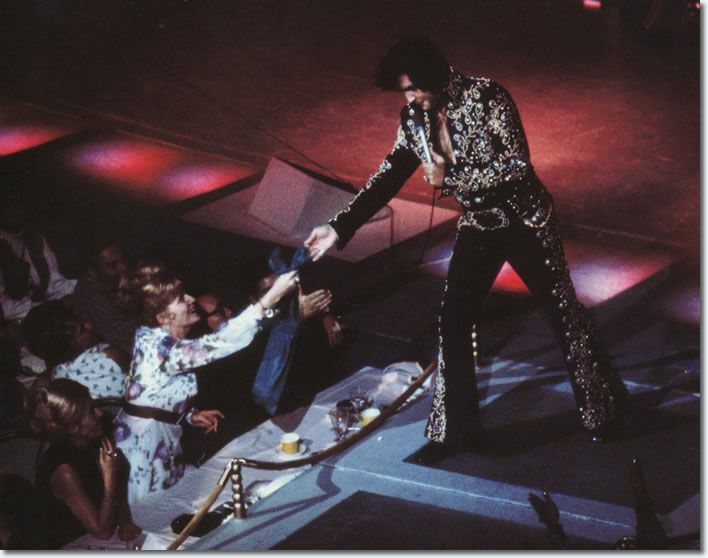 July 8th will mark the 40th anniversary of my first Elvis concert in 1975. There would be two more, one in 1976, one in 1977. 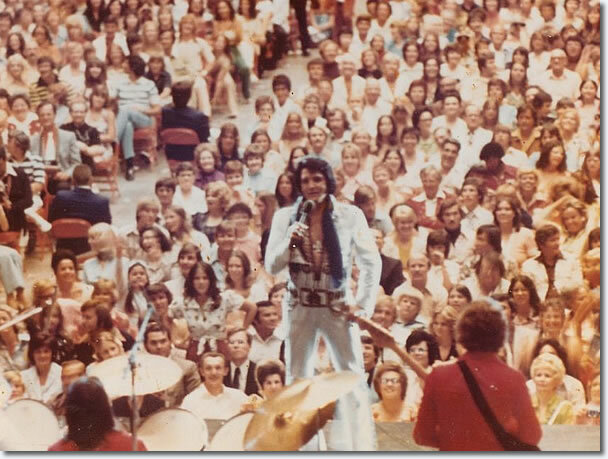 After the March 25, 1977 concert, as we did each year, my sisters and I anxiously awaited the announcement of Elvis’ appearance in our city the following year. We knew his tour would bring him through Oklahoma City, we just didn’t know exactly when, and we had to stay on top of it, because his tickets sold out very quickly. However, instead of hearing the dates of his 1978 tour, five months later, we received the announcement that he had passed away. 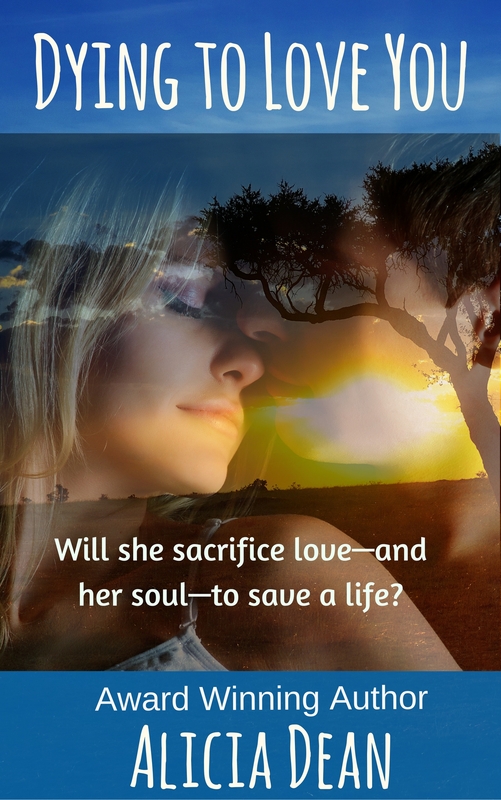 We were shocked, devastated, grief-stricken, as was most of the world. In the weeks leading up to the concert, I feel like ‘THE DAY’ will never get here. It’s almost all I can think about. Then, the day comes, and I’m so excited, I feel like I’ll burst with anticipation. We arrive at the packed Myriad Convention Center (now the Cox Convention Center) and find our seats. They are far from the stage, but it doesn’t matter. I will actually be in the same room with Elvis…it seems impossible, too good to be true. I admit, I don’t remember anything about the opening act(s). All I recall is wishing they would hurry up and finish, so Elvis would come on stage. I can literally feel it moving through me, vibrating my insides. My body tingles, my heart drops into my stomach. I can barely breathe. I can’t believe that, in moments, I am going to see Elvis… The spotlight shines at the side of the stage, then Elvis appears, strides out onto stage, and the crowd goes insane. I am screaming, crying. Elvis starts singing C.C. Rider (I wish I could remember each song he sang, that I had written them all down, but I didn’t. I wasn’t thinking about it back then, about how I would want to hold onto every minor detail of the memory, I was living in the moment. :)) I am not close enough to see him that well, but I have binoculars, and I can bring him nearer… He’s beautiful. He smiles and smirks and jokes and gives scarves and kisses. I am soooo jealous that I am not one of the lucky girls close enough to get either. But his magical voice booms through the auditorium. The crowd screams so loudly, it’s hard to hear some of the songs, but I can’t fault them, because I am screaming as well. I am crying, too. Partly out of happiness, but partly out of an odd sadness, knowing that this is all I can have of him, these few hours of watching him perform, and then, it will be over. I can’t touch him, I can’t meet him, I can’t be a part of his world. I can’t marry him… (Yes, I definitely wanted to marry him. I fantasized about it, as many, many young girls and women did.). The air sizzles with electricity. There is nothing like the feeling of being at an Elvis concert…knowing that he is THERE, in the room, in the flesh…it’s surreal and amazing. Much too soon, it’s over. He sings “Can’t Help Falling in Love” and kisses more girls, shakes hands, and I know…he’s going to be gone in seconds. Then, he waves, strides off stage, and an intense loss fills me. I’m still happy, because I just saw Elvis live…but I’m also deeply sad. It’s over. And, I know, that nothing else that will happen can compare when I just experienced. 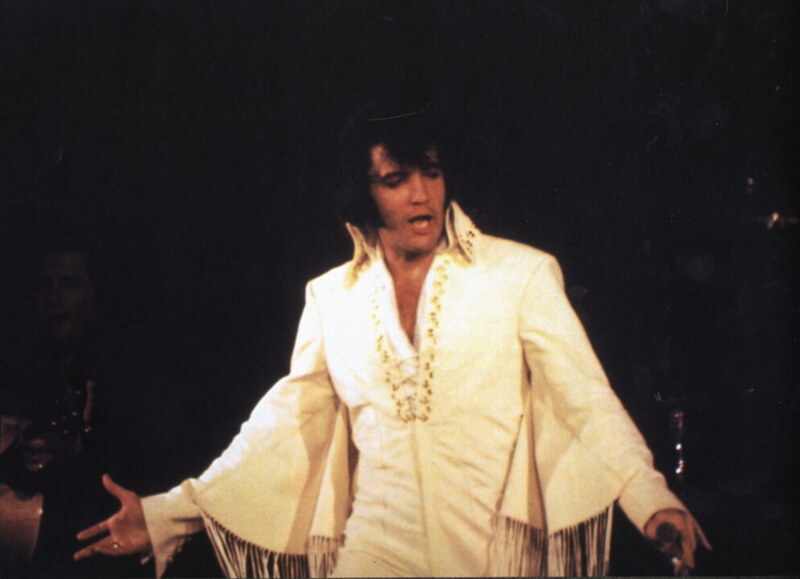 Elvis shows he’s a showman, manipulating the audience to the point that he can curl his lip and get a reaction. His show contains no elements of surprise, but it needs no drama, for the audience provides the tension. Presley has reached the point in his career – maybe the plateau – where he doesn’t ever need to sing another new song. The fans are there, evidenced by the sellout of 15,000 – plus tickets in a single day for the Myriad concert. He can probably come here anytime he wants to – five days in a row – and fill the place. If nothing else, Elvis Presley is a phenomenon, finding fans from every walk of life and in generation after generation. Elvis doesn’t need to milk an audience for its applause. All he has to do is show up. I know that I am luckier than many Elvis fans. Some never saw him in concert at all, and I feel truly blessed that I did. Thanks to my parents, who knew how much it meant to me and my sisters. I am still slightly resentful that they did not allow me or my younger sister, Ruth, to go to the first Elvis concert my two older sisters, Sheri and Janis, attended. Granted, it was in 1970, and Ruth and I were ‘almost’ 7 and 9, respectively, but still…I thought we should have been allowed to go. Don’t you? 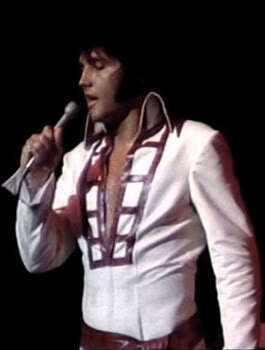 Did you ever see Elvis live in concert? What is the most memorable concert you’ve ever been to? Had the chance and passed on it because we didn’t want to spend so much money for seats that damn far from the stage – he was playing in a huge stadium. We thought, “Well, he’ll be back.” He died three weeks later. But I certainly understand your excitement. That’s how I felt upon getting tickets to Streisand’s first concert at the MGM Grand here in Vegas; billed at 2 performances only to fulfill a contract she’d signed with Kirk Kerkorian way back when. And, said she’d do these and never go on stage again. My one and only chance to hear her sing in person? I had to do it. It turned out to be a New Year’s Eve to beat them all. Of course, I’ve seen her twice since then…each one an experience I’ll never forget. Oh my gosh. I bet you wish you had gone. Barbara Streisand and Elvis had a great deal of respect for one another. 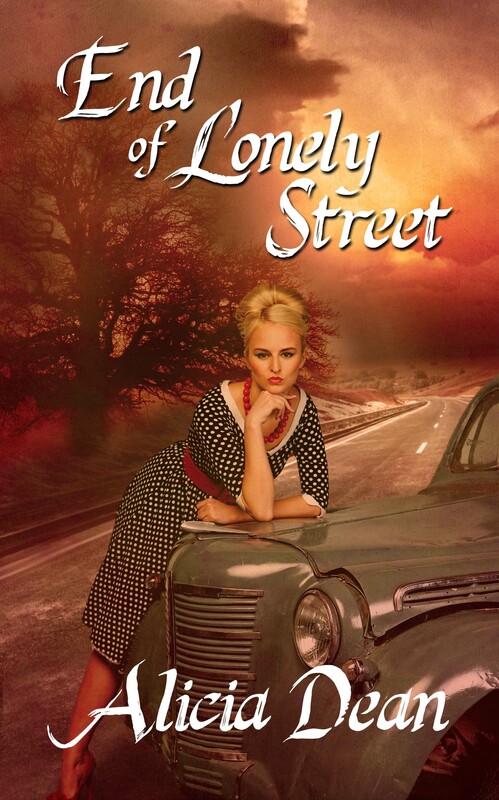 You probably know that she wanted him in the lead of A Star is Born, rather than Kris Kristofferson, but the Colonel wouldn’t allow Elvis to do it. Thanks for stopping by! Great memories, Alicia. 🙂 I love the comment that Elvis just needed to show up to fill the room with electricity. I never had the pleasure of seeing him in concert, but he was sure electrifying on the TV. You helped to bring the real thing to life.